The potential harm to health of asbestos was discovered decades ago, but it is regrettable to note that asbestos still exists within the structures of quite a number of buildings. This is why asbestos testing in NJ and NY is important to ascertain that the occupants of any building are not predisposed to this element in any way. At A. Mac Contracting Inc, we offer affordable, reliable and quality asbestos testing in NJ and NY for all types of structures, including both residential and commercial buildings. With the deadly effects of asbestos, nothing short of perfect inspection service is needed when conducting asbestos testing in NJ and NY. This is because any slight mistake or oversight in the testing can lead to lifelong suffering to the occupants of the various structures. We have trained and licensed inspectors, with adequate field experience necessary to carry out conclusive asbestos testing in NJ and NY and come up with the necessary remediation options. Visual inspection for the presence of asbestos materials. A summary report on asbestos testing in NJ and NY with conclusive remediation plans. We not only offer asbestos testing in NJ and NY alone, but also we have the versatility to provide other related services depending on the needs of the client. For instance, we can perform asbestos sampling for minor renovation projects. We also have the capacity to do comprehensive asbestos testing in NJ and NY for demolitions and big renovation projects, including dust mitigation measures following mega construction projects to determine the presence and the levels of naturally occurring asbestos. Asbestos testing in NJ and NY can no longer be taken lightly. As a building owner, a tenant or just an occupant, you need to take it upon yourself to ensure that the structures you inhibit are free from asbestos. 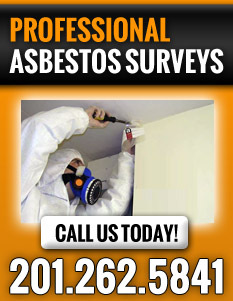 Call us now for prompt asbestos testing in NJ and NY and be safe from the effects of asbestos on your health.